Sedona artist Anni Adkins chases light. When she catches it, she gives it form with canvas and oil paints. ANNI ADKINS creates artworks in oil paint that virtually defy characterization as either realism or abstraction; the paintings can be viewed as either, or both. 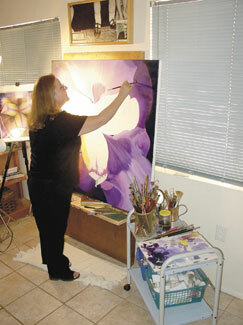 Here, she works on a large-scale flower blossom in her Sedona studio. Adkins said she actually sculpts her paintings by using many layers of oils. It is something for which she has been searching and preparing most of her life. Here, in the Southwest, Adkins says "I have found my art." Currently at work on large-scale landscape and contemporary flower paintings, Adkins' experience in realism and abstraction have found harmony in nature. She paints her subjects realistically but up close and out of context, and the result is a stunning interpretation of natural beauty. Is it realism, or abstraction? Yes. Adkins began preparing for the discovery of her art when she was a small child. In third grade her teacher used to let her sit off by herself and draw with Crayons. When she was between the ages of 10 and 12, she found inspiration from comic books, but not in the same manner most children do. "I'd sit with a stack of comic books and draw all day long," Adkins said. "I'd copy them from the front page to the last." At 13, Adkins entered an art competition sponsored by the American Red Cross while she was attending an American Military School in France. She won first place and was awarded a full scholarship to L' Ecole De Beaux Arts in France. After working in display art for major department stores in Florida for several years, Anni and her second husband, photographer Joe Hoover, started a modeling and advertising agency. 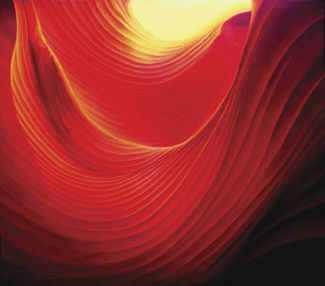 ADKIN's layered technique brings amazing life to the unique light of swirl in Antelope Canyon. It was during that time that Adkins started creating photorealism paintings. When her daughter, Kori, left home, Adkins was ready for a change in her art. "I finally got tired of working in black and white," she said. "I came home one day and started doing abstracts with bright colors. But after a while I found it very lacking." Adkins and Hoover left Florida in a recreational vehicle. "We went on a search for art," Adkins said. That search eventually took Adkins and Hoover to New Mexico. "We stayed in Santa Fe for a couple of months, trying to find studio space and taking lots of photos," she said. When they couldn't find studio space, the couple headed to Texas. Hoover started photographing Carlsbad Caverns, and Adkins was intrigued by the potential of those photographs as subjects for her art. "That was the beginning of me finding my art," Adkins said. Adkins and Hoover opened an art gallery in Dallas. But most of her paintings had sold, so they ran the gallery by selling the works of other artists. Adkins said that although she felt she had found what she'd been looking for, she knew she couldn't spend the rest of her life in the caverns. David McCullough, an abstract expressionist, told Adkins, "You've got to go to Sedona. You'll find your art in Sedona." She followed McCullough's advice. "I was so overwhelmed by the light, I didn't paint anything for the first six months," she said. Then she saw photographs by Michael Fatali of Antelope Canyon. "I said, 'Oh my God, that's it,'" she said. "I decided to let my work flow wherever it will. After all, art is about development." "From then on, I've just been trying to get enough painting together to show," Adkins said. That isn't always easy when collectors are trying to purchase her work. "I've been trying not to sell for five years, trying to get enough together to exhibit," Adkins said. She does sell smaller originals and many prints, mostly through the Internet. "I sell quite a bit," she said. "Also, other people on the Internet rep me." But mostly, Adkins stays busy sculpting her works with layers of oil paint and going out after the light. She delights in living and working in the Southwest, and she has no intention of moving. "I'm in Sedona to stay," she said.